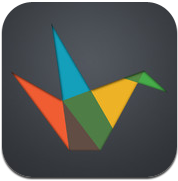 Haiku Deck is a free iPad app for creating slideshow presentations. There are two features of Haiku Deck that stand out. First, Haiku Deck intentionally limits how much text that you can put on each of your slides. Second, Haiku Deck helps you find Creative Commons licensed images for your presentations. When you type a word or words on your slides you can have Haiku Deck search for images for you. The images that Haiku Deck serves up are large enough to completely fill your slide. You can also upload your own images from your iPad or import images from Instagram and Facebook. Check out http://pinterest.com/haikudeck/education-case-studies/ for examples of how Haiku Deck has been used. Choosing the right math app is very important. 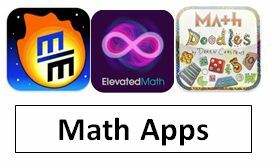 Checkout some of the apps below…they are just a little more than skill and drill PLUS higher-order thinking. Evernote is a web tool that allows users to bookmark, record voicemails, take text and voice notes, upload pictures, docs, PDFs and files, and capture images and information on the web as well as as a software download on your computer or as a plugin for your browser and also as an application for your mobile device. Why Evernote in education ? Evernote makes it easy for everyone to easily remember things big and small using computer, phone and the web. It is a great organizational tool for teachers and students. Evernote automatically process and index anything one captures on the web and it makes this content searchable. It also allows users to add tags and organize notes into different notebooks. Evernote automatically synce all your notebooks to the cloud and everywhere you have Evernote installed. Evernote has apps for all kind of smmartphones meaning you can access your notes everywhere you are. Evernote has browser extensions for the major browsers making it down to earth easy to take notes and organize bookmarks right from your browser. Evernote has a special section for education called Evernote for Education where you can learn about how teachers and students are using this tool. Evernote has apps for Android, iOS, HP/ Palm webOS, Blackberyy, and Windows Mobile devices. The different platforms you can use to access your Evernote also makes it easy for you to backup and export your notes in a variety of formats. You can use the camera on your phone or web to take screenshots of images. Evernote is able to recognize the text inside the images which is great for capturing posters, printed memos and more. You can also upload attachments to your notes. These attachments can be PDFs, PowerPoint, Excel, Word, Images and many more. You can use Evernote to email both your text and voice notes and scan papers. Evernote even keeps hyperlinks in a text when clip it. Evernote has a very powerful free version which we can use in education, but it also has a premuim version that offers greater sharing options, gives access to note history, search PDFs, faster image recognition, and no ads for $5 per month or $45 per year. 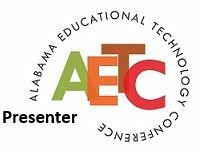 The first and foremost usage of this tool for educators is to take notes in class or when attending a lecture , a conference, a symposium, wherever they feel the need to capture and save ideas for later review. They can use it to create to-do lists and work logs via recording tasks completed in Evernote, along with the beginning and end times. Store all the teaching materials to use during the whole year , one example is the grading templates such as grade sheets or student assessment forms. Use Evernote to make up for your absence by sharing a notebook with the substitute teacher ( like lesson plans, worksheets, answer keys and examples of completed work ). You can create a public notebook containing key notes you want to share with your students. Share this URL with the class and parents and let them view anything you add to your notes. Keep your extracurriculars in one place and in order. Save bookmarks and anootate webpages using Evernote. Teachers can add screenshots to help kick start their memory when looking for useful website. They can use it to scan teachers handouts, taking snapshots using a canera and not having to worry about loosing the orignal copies. Students can use Evernote to record audio notes on their phones or iPad for lectures and teachers talks. Students can share their notes and notebooks with each other and collaborate on their assignments.